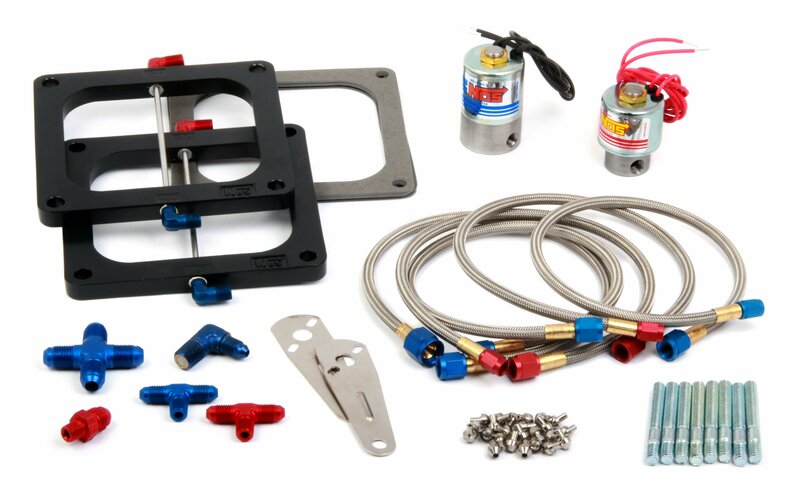 This kit does not include bottle NOS sells and supports a full line of competition NOS fuel system components. The Pro Shot Fogger upgrade kits take your Pro Shot Fogger system and converts it into a two stage Pro Shot Fogger 2 kit. The dual stage feature allows the user to jet the first stage for traction off of the line, then in the second stage utilizing a Cheater spray bar plate, add maximum mid-range and top-end power. Through testing, NOS has optimized the jetting of the Pro Shot Fogger 2 upgrade kits for improved power and performance. Available in single four or dual four applications in either a Holley® Square Flange or Holley Dominator® bolt pattern, the Pro Shot Fogger 2 upgrade kits come complete with NOS new improved Cheater nitrous and fuel solenoids, Cheater spray bar plate(s), jetting and all the necessary hardware to upgrade your Pro Shot Fogger into a dual stage Pro Shot Fogger 2 system.